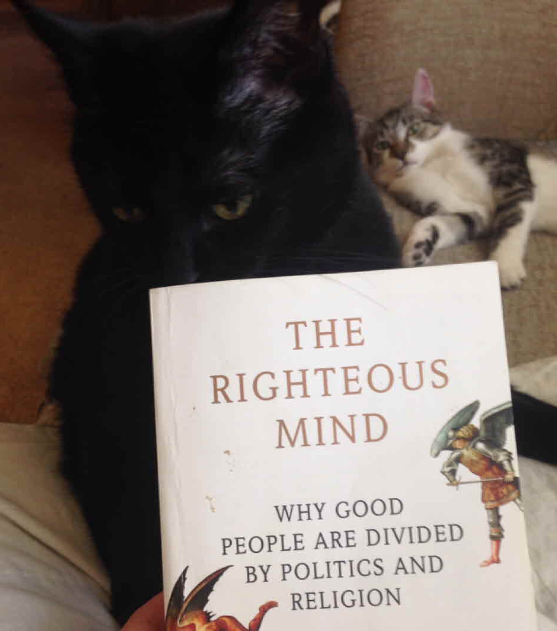 The Righteous Mind explores the polarization of American politics with a focus on the different moral foundations of conservatives versus liberals. He explores the question of why both conservatives and liberals tend to think they are morally in the right and that the other side is morally wrong. Haidt spends the first two chapters providing experimental evidence of why Hume was right to say that reason is the slave of passion. He suggests that you can’t make reasoned decisions without emotional backing. Haidt uses Damasio’s findings, presented in his book Descartes’ Error, to back this up. Damasio found that people who do not feel emotion due to brain damage are flummoxed by even small decisions like what brand of milk to buy or what order to perform a set of tasks. Haidt then references studies that suggest that people will use emotional intuition to come up with a point of view, and then look specifically at evidence that supports this intuition, ignoring evidence that contradicts their own views. In his own studies (see figure below), Haidt breaks down people’s morals into categories: care about others, fairness, loyalty, authority, and sanctity. According to Haidt’s studies, liberals value caring about others and fairness much more than loyalty, authority, and sanctity. 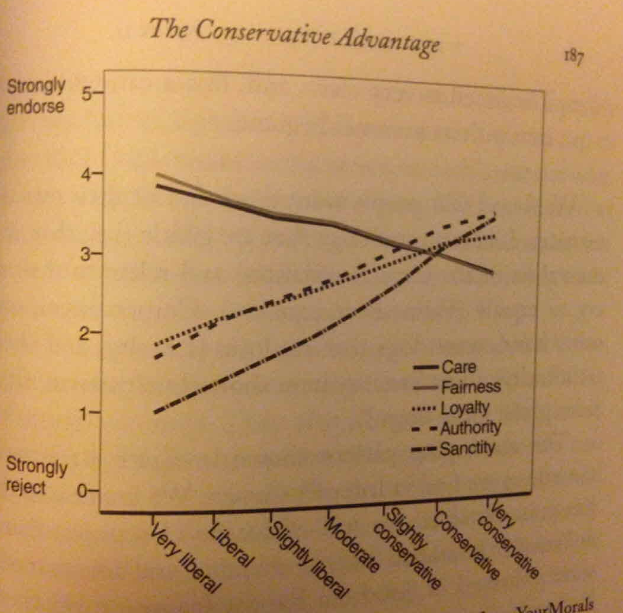 Conservatives value loyalty, authority, and sanctity more, and value care and fairness to a lesser degree. The interesting bit is that conservatives have a broader (more diverse) range of what they care about than liberals do. They care about their less important values more than liberals care about their less important values. Haidt suggests that this is why Republican candidates purposely apply to the emotional side of people more than Democrats do. And since people’s rational decisions are based on emotion, the Republican candidates have an advantage with moderate voters. Haidt goes on to answer the question: “Why do poor, rural, white folk vote against their economic best interests?” He suggests that they’re voting for their moral interests – loyalty, authority, and sanctity. The next part of the book is about evolutionary group selection. Many people believe that groupish behavior evolved in our species because a group of individuals was more successful at producing offspring than single individuals. But Haidt asks the question: how can such behavior evolve when selfish individuals within a group can take advantage of the group to be even more successful than the altruistic group members? Wouldn’t evolution then favor the selfish ones? He answers this question describing a situation breeding chickens. If the chickens who produce the most eggs are inbred, then the offspring end up laying more eggs. But they also end up more aggressive, which is a trait linked to high production of eggs. Because the chickens are more aggressive, they attack and kill each other, leading to lower egg production per cage. If you, instead, breed the cage that produces the most eggs compared to the other cages, the cages of offspring end up with more eggs. Thus, evolutionary group selection is about selecting an entire group, and not about breeding individuals within a group. Haidt suggests that this is why humans tend to break into groups. Haidt goes on to suggest that religious belief evolved as group selection (groups of religious people survive better than groups of nonreligious people) rather than as an evolutionary trait of individuals. So people not only have a tendency to break into groups, but to have a formal set of values within each group. In the end, we follow our values and tend not to understand that another group’s values may be founded in truth as well. This sounds interesting, although a book to approach with caution. It is hardly possible to study society without making broad assumptions of the masses, but I think that there are mostly gray lines when it comes to people. For instance, I am a Christian, but I care nothing for being a part of the group. We are devote enough about our beliefs about God and how he intends for us not to judge and his call for us to love people, which isn't always consistent in the Church, although it is biblical. Our family has chosen to homeschool our children (who are now grown), and our granddaughter will be homeschooled because of these beliefs, so we not only removed ourselves from the public school circle, but from the Church as well. We do not attend. I like the idea of it, but it is largely impossible to be among a large group of people who don't end up interjecting some messed up interpretations. I say this only because I personally know of dozens like me, and there is little doubt that there are an equal number of liberals who are also living in that beautiful gray area which is the place that we can begin to find common ground and come together. Either way, this book really does sound like it would interest me greatly, and I will plan to read it. You have a lovely write up here, and I've enjoyed it. I'd approach any book in the social sciences with caution. In fact, I approach books in the hard sciences with caution, too. People are often trying to get across a certain point and they ignore the data that supports the contradictory point. Which, ironically, is a point of this book. lol. But I totally see what you're saying. Not everyone wants to associate themselves with groups, but a heck of a lot of people do. And it's the groupishness that he's analyzing in his book. I doubt he thinks that the book applies to everyone. In fact, he noted several times that by separating “conservative” from “liberal,” he's making some pretty big generalizations. This sounds like such a relevant and fascinating book! Something I've been thinking about a lot this election is how I view Trump because I firmly believe that many of his positions violate fundamental human rights and are ethically unforgivable. It definitely makes me feel more uncompromising to his and his followers' beliefs. Yup. Me too. And that's exactly what this book addresses. It did help me to see the world in a bit more of a shade of grey, but I don't see myself ever becoming a centrist like the author.